DJI’s flagship drone, the Inspire 1, looks like it’s suited to be in a Terminator movie. While this won’t become sentient and threaten all mankind (we hope), the Inspire 1 is equipped with all kinds of advanced technology that allows you to capture incredible 4K videos and 12-megapixel photos like none other. This is thanks to its gimbaled platform, and transforming landing gear that raises during takeoff to give you a completely unobstructed view from the camera. The Inspire 1 uses four incredibly powerful motors connected to carbon fiber legs, which help propel the craft to speeds past 50 miles per hour, while also maintaining maneuverability. 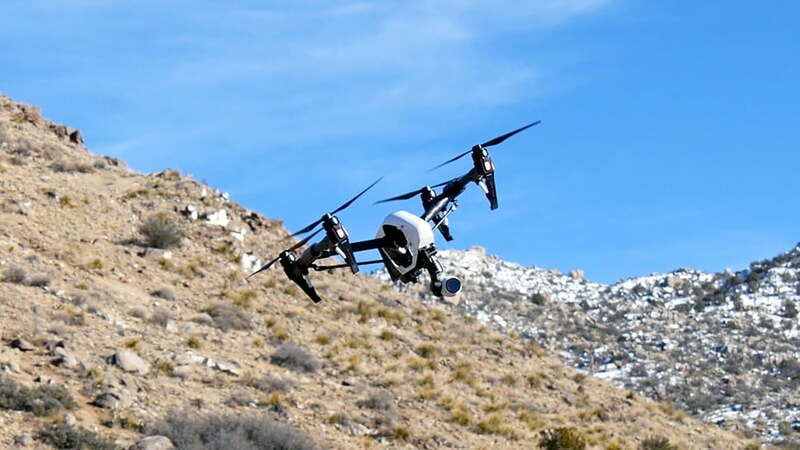 This is especially fun when paired with DJI’s lightbridge technology, which allows you to see a live camera feed of what the Inspire 1 is seeing — from up to a mile away. The included 4K camera takes MicroSD cards up to 128GB, and can rotate a full 360 degrees and 120 degrees up and down. The remote is pretty intuitive and handles similar to what you’ll find in other quadcopters. On the right joystick, right and left will make the Inspire 1 travel side-to-side, and up and down will move it forward and reverse. On the left joystick, up and down control your altitude, whereas left and right adjusts the direction the Inspire 1 is facing. Using rockers on the front of the remote (placed similarly to where the trigger buttons are on a PlayStation controller), you can also control the camera angle and adjust camera settings. To fire up the live video feed, simply plug in your iOS or Android phone into the remote and launch the DJI GO app. This app is extremely feature rich, and you can see all your flight information, GPS, remote connection strength, and even adjust all of your camera controls during flight. The DJI GO app (Android | iOS) also contains a flight simulator, an extremely intuitive movie editor, and flight logs where you can review all of your past flights. As for in-air performance, the Inspire 1 boasts a number of intelligent flight functions. The three most advanced are point of interest, waypoints, and follow-me mode. In point of interest, you hover the Inspire 1 over the point you wan to orbit and select this in the app. Then you back away from that point to define your radius, select your speed, and hit apply. The Inspire 1 will orbit that point keeping the camera facing that direction. While it is orbiting, you can focus on the camera controls while the Inspire 1 flies itself. In waypoint mode, you fly over the points you want to define as your flight path and select those points in the app. After you have completed your flight path, you hit apply to upload your points into the Inspire 1’s flight plan. It will return to the first point and execute the flight plan while you control the camera. The coolest feature, though, is definitely follow-me mode. When you apply this, the Inspire 1 will follow wherever you take its remote (as long as your phone is connected to cellular data to share its location). I was able to enable this mode, place the remote on my car’s dash, and drive over a mile while the Inspire 1 followed me the whole way (you have to keep your car around 30 mph so it can keep up, however). This is truly going to revolutionize car commercials, or take selfies to a whole new level. The videos you can capture with the Inspire 1 are truly amazing. It effortlessly soars through the air, and the gimbaled platform and 4K camera capture fluid and smooth videos. If you’re interested, the Inspire 1 can be picked up for $2,600 for the single remote version, and $3,200 for the dual remote version. You can also purchase the Micro Four Thirds Zenmuse X5 and X5R cameras to record even better footage in the air. Sure it’s steep — but as far as we can tell, this beastly quadcopter is one of the best drones money can buy right now.